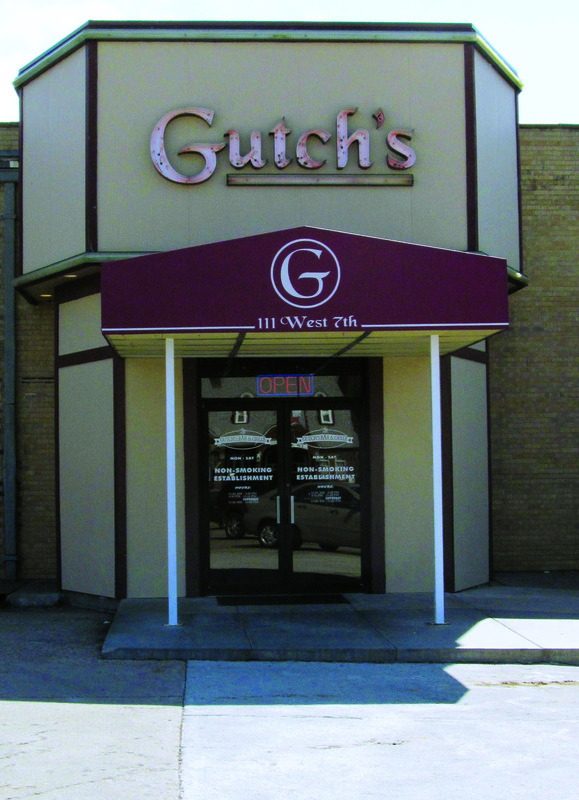 Gutch’s Bar and Grill in Hays, Kansas could be one of my new favorite pizza places. It certainly ranks high on my list of Hays restaurants. Their specialty is wood fired pizza. It is very similar in deliciousness to what you will find at another favorite, Dave’s Pizza in Coldwater, Kansas. I would call Gutch’s décor half fine Italian restaurant, with the dark woodwork and Italian inspired photographs, and half sports bar with the metal ceiling, big screen TV’s and centrally located bar. This place is located in Downtown Hays within walking distance of Fort Hays State University. The prices are low enough that a college student could probably afford the occasional meal here. I took my wife and son out for a meal and the ticket was only about $25 bucks! We had a pork lover’s dream; a pepperoni, sausage and Canadian bacon pizza and a side of cheesy bread sticks. I asked my host how long they had been in business, because the place looked relatively new, and he said about 10 years. I can’t believe I had not been there sooner, but I guarantee I will be back again soon!